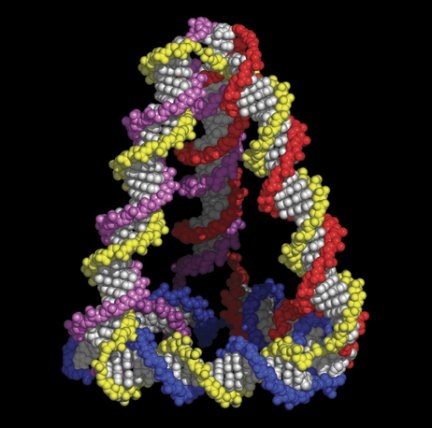 The most sophisticated exercises in using self-assembly to make nanoscale structures and machines have used, as a constructional material, the biomolecule DNA. This field was pioneered by NYU’s Ned Seeman. DNA is not exactly stuff we’re familiar with as a constructional material, though, so I don’t suppose many people have much of a feel for some of its basic mechanical properties, like its stiffness. An elegant experiment, reported in Science at the end of last year, Rapid Chiral Assembly of Rigid DNA Building Blocks for Molecular Nanofabrication (abstract free, subscription required for full article), sheds a lot of light on this question. The achievement of this work, reported also in this Science News article, was to devise a method of making rigid DNA tetrahedra, with edges less than 10 nm in size, at high (95%) yield (previous methods of making DNA polyhedra had much lower yields than this). A model of one of these tetrahedra is shown below. But, not satisfied with just making these tetrahedra, Russell Goodman (a graduate student in Andrew Turberfield’s group at Oxford) was able to image them with an atomic force microscope and measure the response of a tetrahedron to being compressed by the AFM tip. In this way he was able to measure the spring constant of each tetrahedron. The spring constants he found had an average of 0.18 N/m, which is reasonable in the light of what we know about the stiffness of DNA double helices. We can use this number to estimate what the stiffness – the Young’s Modulus – of the solid that would be made if you coupled together many of these tetrahedra. The precise value will depend on how the tetrahedra are linked, but a good estimate is about 20 MPa. Compared with a covalently bonded solid, like diamond (whose modulus, at around 1000 GPa, is 50 thousand times greater than our DNA solid), it’s very much floppier. In fact, this modulus is in the range of a relatively hard rubber, of the kind a shoe sole might be made of. On the other hand, given that the material would be mostly water, it’s pretty stiff – probably about a thousand times stiffer from Jello, which is similarly made up of a network of biopolymers in water. It seems to me that using DNA this way is a bit silly. Why not use either cells themselves, or our normal inorganic materials? Why try and use DNA in a way which is neither one paradigm or the other, as if trying to apply bridge building knowledge to airplane design. DNA is a tempting material to use because it exploits the general features of the “soft” paradigm – weak binding energies (i.e. comparable to kT) and the dominance of Brownian motion, use of molecular conformational change – and because of the simplicity and specificity of the base pair interaction, it is relatively simple to model and understand. It also has the very nice feature that the transition from single strand to duplex involves a huge change to the rigidity, so you can switch from a state where you can exploit the flexibility of the chain to one in which the constructional elements are (relatively) rigid. I’m sure that ultimately we’ll work out how to do “soft” nanotechnology with a much wider palette of materials and with some more complex design principles (e.g. finding analogues of protein folding) but for now it’s a good playground for learning the principles. The nano-construction jobs that DNA should be very good at are: a smart glue that could stick particles together in a programable way; labeling, sorting and positioning nano-objects; self assembling nano-scale scaffolds, molds, and rulers. All in all its quite a tool set to start with. DNA is also used, I believe, simply because there has been such extensive research on it. So there’s a large body of knowledge and very significant tools and technologies have been developed, such as commercial synthesis of arbitrary sequences and analysis of arbitrary sequences. So it’s possible to do such experiments with DNA now at relatively low cost.